The E452T Sorrento models are wonderful guitars and unsung heroes in some ways. The comparable Gibson branded ES-125TC model seems to get more attention and were made in greater quantities. 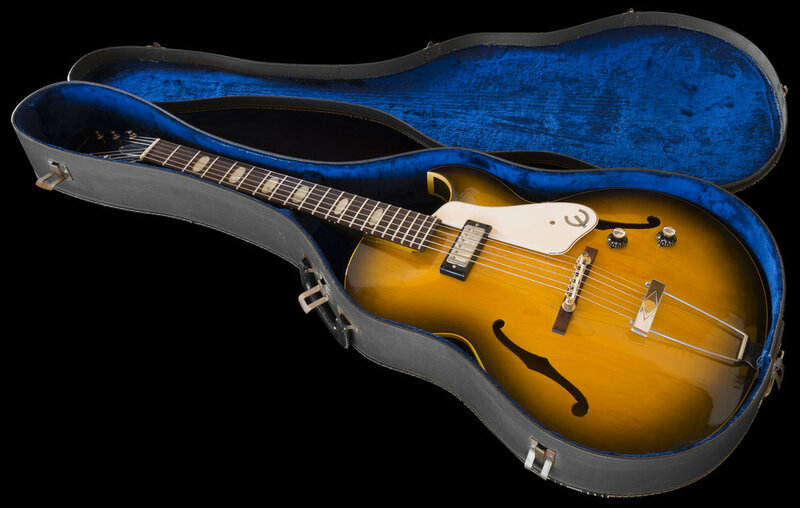 Just 199 of these Sorrento's were shipped in 1963, while 572 of the Gibson ES-125TC's were shipped during the same period. 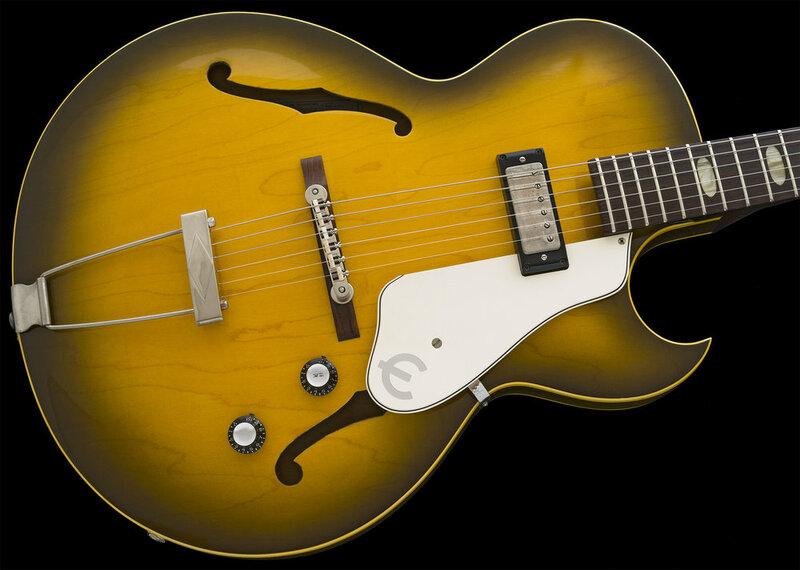 This model was Introduced in 1960, shortly after CMI, (the parent company of Gibson) acquired the Epiphone brand in 1957. 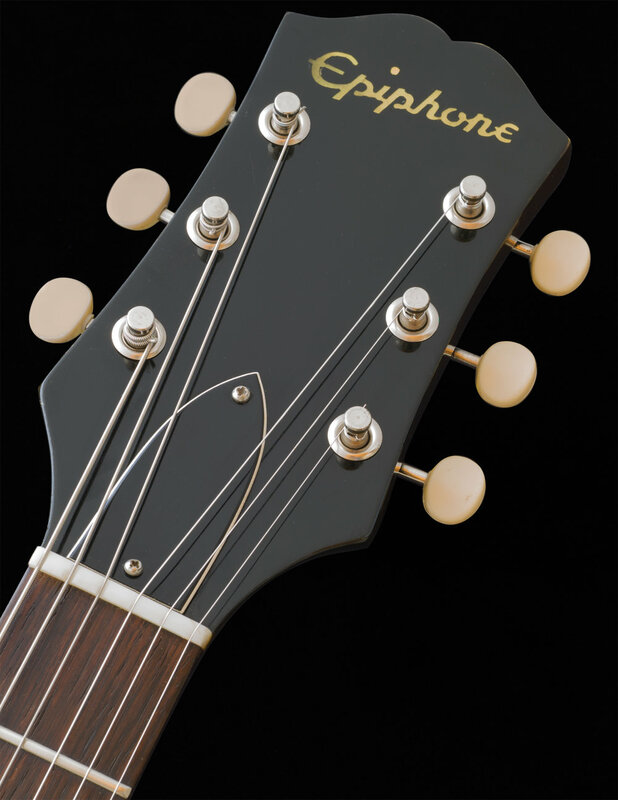 The Epiphone line of instruments commonly share both similarities and differences with many of their brethren, the Gibson-branded models of the same time periods. These single cutaway, hollow body thin-line guitars feature arched Maple tops with Maple backs and sides. They have a powerful, quiet and clear sounding Mini-Humbucking pickup whereas the Gibson-branded counterpart, (the ES-125TC), has a single coil P-90 pickup, making these a wonderful collection addition or alternative sound. Factory equipped with a Tune-O-Matic bridge assembly and this one retains its original pre-wire Nickel-plated ABR-1, this model year also has great looking Oval fretboard inlays, 1-Piece mahogany neck construction and this particular example has a colorful Brazilian Rosewood fingerboard. I have examined, tested, serviced and set-up this instrument and found it to be factory-correct and unmolested in every way. All of the electronics, frets, nut, finish, tuners and both the plastic and nickel plated metal hardware are all Correct and Original to the guitar. Remarkably, the instrument has not finish-checked and has only minimal signs of human contact. The ROYAL OLIVE Sunburst is both a RARE and attractive finish as is the accompanying Green stain on the back, which is fabulous and unfaded as my large and clear photos reveal. 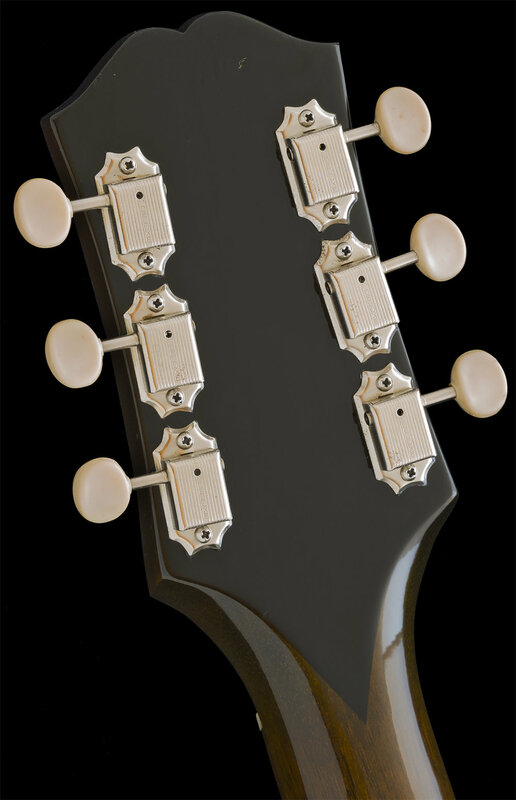 The nickel-plated hardware, is clean and the guitar is stunning in every way! 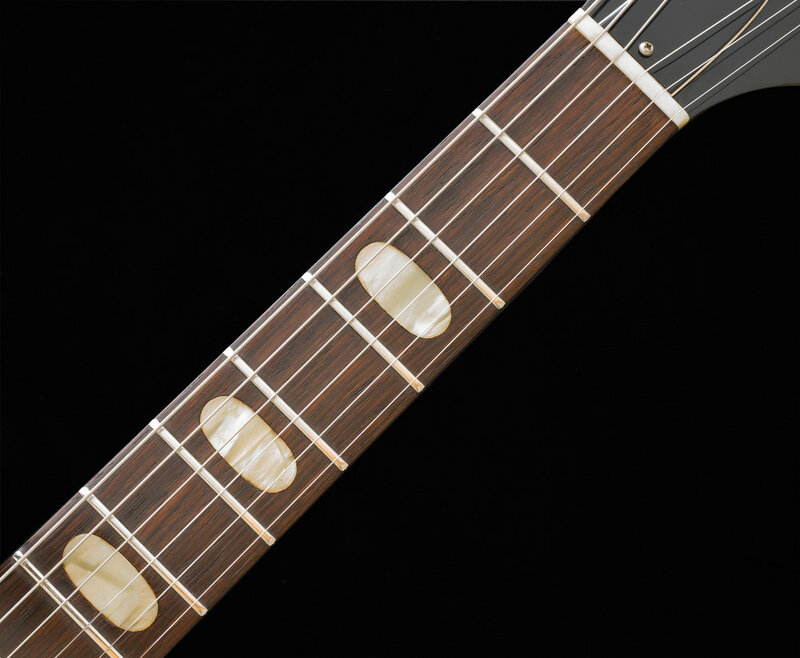 The Neck has a round profile shape with a wide 1 11/16" nut width, and the guitar plays very well. These are lightweight guitars and generally speaking, very comfortable to play. The gray Epiphone Arch-Craft case is in Very Good Condition with a fully functioning handle, latches, and hinges. The guitar has just been set up using a set of D'addario XL's, 10 - 46 gauge strings. 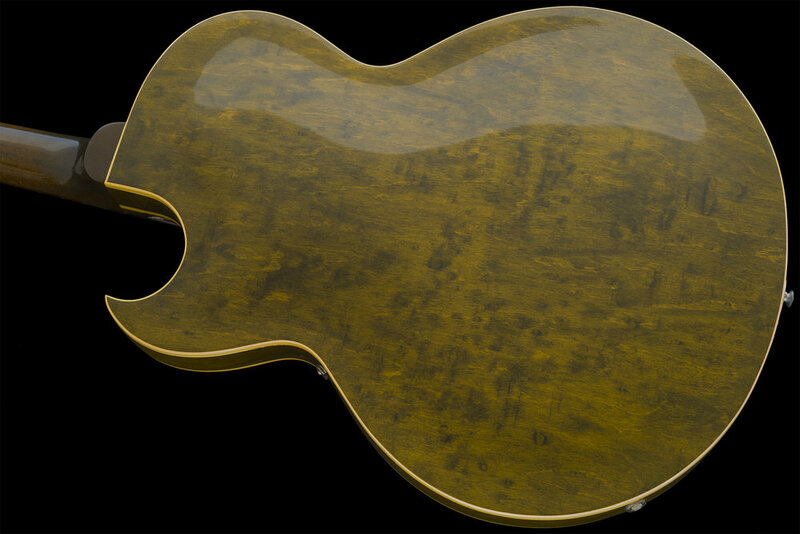 This is a GORGEOUS guitar in my opinion, with an unfaded Sunburst finish. I acquired this beautiful instrument 25 years ago, and it has been quietly resting in my Epiphone Collection. It is now 55 years old and has been spared all of the "circulation" that most vintage instruments being offered online today have undergone. The guitar is very crisp and clean and has NOT had any repairs, parts restoration or any modifications; it is 100% Original and remains in beautiful, unmolested and well-preserved condition. In my opinion, the Wide nut width, Oval inlays, Royal Olive finish and Brazilian rosewood fingerboard features of this particular model year all culminate to make it the Best of the Sorrento line. If you are a discerning buyer and like these models, the chances of finding another example of this caliber may not be easily accomplished. There is something about the SIMPLICITY of this guitar that I find hugely attractive, which is why it was in my collection for so long! If like me, you might also feel an attraction to it, kindly inquire.